with AC adapter & loud siren COOL! This listing is for a fully assembled and tested reed switch based security system module. It is great for for paintball/airsoft enthusiasts, and students. We also sell these in DIY kit for a few dollars less, so check out our store. The above video shows you how it works, and acts as a user manual. It also shows off the process in which this device is assembled. 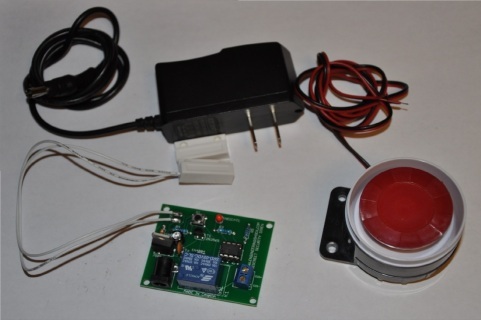 It includes an AC adapter and a loud siren that connects directly to the main board. If after watching the video you have any questions at all, please do not hesitate to ask! When you power the device on (plugging the AC adapter), the on board indicator LED flashes once. From there, the device waits for you to press the SEL button on the main board. The reed switch module has a magnet counterpart that it must be lined up with. If you press the SEL button and the magnet/REED switch are not lined up, the LED flickers until the door is closed (Lined up). From there, the LED will stop flickering. When the door is re-opened, the LED will flash 20x times before the alarm will sound through the relay. This gives you time to press the SEL button to deactivate/reset the system. If the alarm sounds, all you have to do to deactivate it is press the SEL button again to turn it off, at which point the device will reset. The reed switch and the magnet both have mounting holes on them, as well as a removable piece of strong double sided tape in case you don't want to mount the device into your wall. WATCH THE ABOVE VIDEO FOR A FULL DEMONSTRATION! 1) A Fully assembled main board with attached reed switch (Via cable), and a mountable magnet.